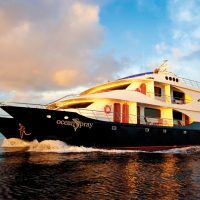 On this journey discover some of the most beautiful islands in the Galapagos. 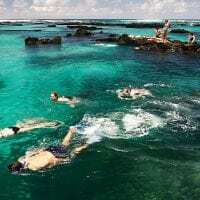 This itinerary begins on Santa Cruz Island, the most populous of the archipelago, where you will meet giant tortoises in the wild and then venture to the shores of Eden Islet, Bartolome, Santiago and Genovesa Islands. A sophisticated, upscale travel experience for 48 guests in 24 outside cabins that combines modern design, spacious rooms, and gourmet cuisine with top adventure. All cabins have air conditioning and private facilities. Three public decks include an ample bar-salon, dining room, natural history library, sky bar and sundeck. A Jacuzzi and gym complete the on board amenities. Included in your cruise cost are the use of snorkelling equipment, kayaks, wet suits, and excursions on a glass bottomed boat. 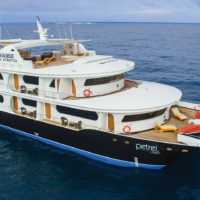 Navigate in this luxurious cruise and travel in style through the Galapagos. 10 out of the 15 iconic species are to be seen during this voyage including the Galapagos penguin, Blue-footed & Red-footed booby, Marine iguana, Galapagos Fur Seal and Giant Tortoise. Explore the Galapagos northern islands including Santa Cruz, Chinese Hat Islet, Bartolome, Genovesa and Santiago. See the incredible Galapagos giant tortoises in the highlands of Santa Cruz. Plenty of opportunities for snorkelling, rides on the glass-bottom boat and kayaking. Admire the incredible life under the sea while snorkelling with Rays, Sea Turtles and Sharks. Get to see the Nazca, Blue & Red Footed Boobies, Frigatebirds, Galapagos Hawks, Marine Iguanas, Galapagos Sea Lion, Galapagos Giant Tortoises & Galapagos Fur Seal among other species. Visit Santa Cruz, Chinese Hat Islet, Bartolome, Genovesa and Santiago Islands. Very early this morning, you will be transferred to the airport for your flight to Galapagos. On arrival in Baltra, you will be picked up at the airport by your naturalist guides and board a bus to the highlands, where you’ll learn about Santa Cruz’s unique ecosystems and biodiversity. Lunch is served at a local restaurant. After lunch, continue by bus to reach a reserve that is one of the best places in the archipelago to see Giant Tortoises in their natural habitat. The tortoises are easy to spot, lumbering around, eating grass and leaves and wallowing in the small pools. There are several lava tunnels in the reserve, too. A short bus ride will take you down to Puerto Ayora to board Yacht La Pinta. After breakfast, a panga ride takes you to Eden Islet, located off the coast of Santa Cruz, where you can observe blue footed boobies diving into the water, reef sharks and frigates. There’s a chance to snorkel and, if weather conditions permit, to ride in the glass-bottom boat. The volcanic setting of this area is quite stunning due to its variety of volcanic debris, including cinder cones, tuff cones, and semi-eroded lava flows. The tiny island of Sombrero Chino gets its name from its appearance, reminiscent of a Chinese hat. This islet, formed only fairly recently, makes a beautiful visit as you will explore the wildlife along its 400-metre long trail, which begins at a crescent-shaped white sandy beach. The cove offers excellent swimming and snorkelling opportunities amid White-tipped Reef Sharks and Galapagos Penguins. This morning, a Galapagos icon awaits: Bartolome Island. A great way to start the day, with a steep climb up a wooden staircase: the view from the top is worth the effort! Following the walk, take to the dinghies for a ride around colossal Pinnacle Rock, followed by time to enjoy the beach and some snorkelling. You can also ride in the glass-bottom boat for great views of the underwater world. After lunch, board the pangas to land at Sullivan Bay on the east coast of Santiago, a white coral sand beach great for swimming and snorkelling, and with a trail over a lava field that flowed here less than 100 years ago. 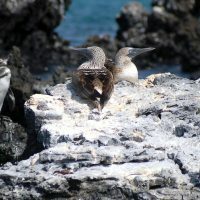 This is the perfect place to see and feel the volcanic origin of Galapagos while observing its wildlife. In the morning, begin your exploration of this island with an easy stroll to observe marine and land birds. There is an optional walk over sharp lava and uneven terrain for dramatic views, or else you can return to the beach to enjoy swimming and snorkelling at this beautiful natural harbour. The more adventurous can snorkel along the cliffs or paddle sea kayaks. The afternoon starts with a very interesting panga ride along the cliffs before you disembark for a short but steep climb up a wooden staircase. Once at the top, the land is flat, allowing for a captivating walk of about a mile to the other side of this small island, observing large colonies of Nazca boobies, Frigate birds and Storm Petrels and the elusive Short-eared Owl. Today you will be transferred to the airport for your ongoing flight.